This photo is of one of our favorite couples of the year. They got married in the Founder's Chapel at the University of San Diego and had their reception at Marina Village in San Diego's Mission Bay. College sweethearts, their families had known each other for years. Unbeknownst to the couple, his mother had actually dated her father in high school! Jonni and Andre are a totally sweet couple, and so in love! This post-wedding photo shows what is rapidly becoming our signature lighting, with a twist and a happy accident thrown in for good measure. 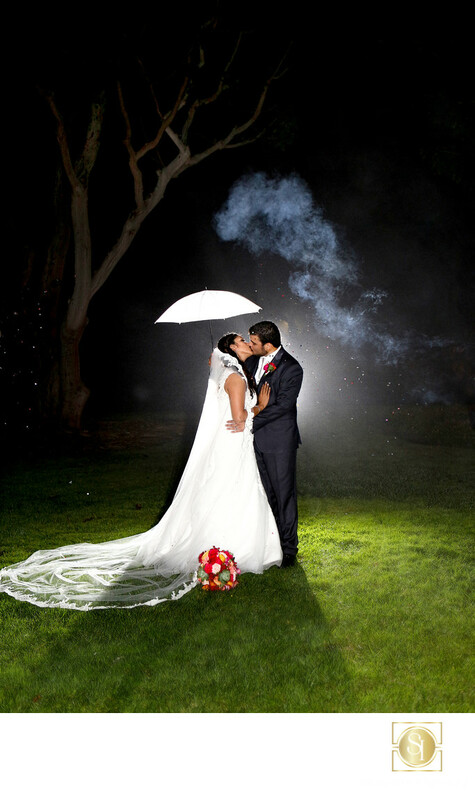 We use one of our Canon 600 EX-RT flashes on one of our Canon 5D mkIIIs and the other on a stand behind the couple. What we added for this shot was a couple of "confetti guns," fired off camera on each side to give the glittery effect you see. That's the twist, the happy accident is the puff of smoke there from the "guns." We think it adds a little bit of dimension, and is certainly something we could never duplicate, even if we tried! Marina Village is one of San Diego's premier wedding venues, with two extensive lawns and multiple reception rooms. There is ample parking and it is very accessible from anywhere in San Diego County, close to several freeways and the airport. Keywords: Founders chapel wedding photographer (3), marina village wedding photographer (3), romantic wedding (6).